Liverpool, UK-based studio Dorothy Collective (previously) has released an updated version of its 2012 Film Map art print, an imaginary city where all streets and places are named after movies, that features new titles that include the 2017 Oscar-winning La La Land and Manchester by the Sea. 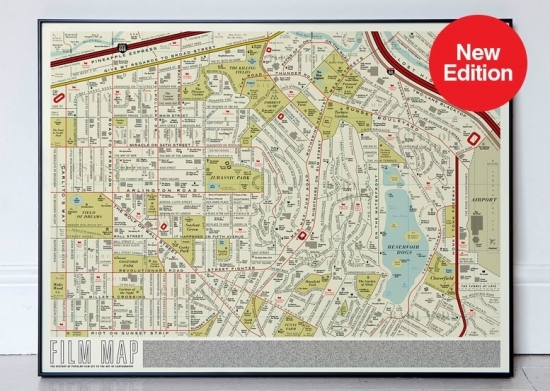 A street map made up of over 900 film titles including cinema classics such as Lost Highway, On the Waterfront, Jurassic Park, Reservoir Dogs, Carlito's Way, Nightmare on Elm Street, Valley of the Dolls, Chinatown, The Wolf of Wall Street and Bridge of Spies. 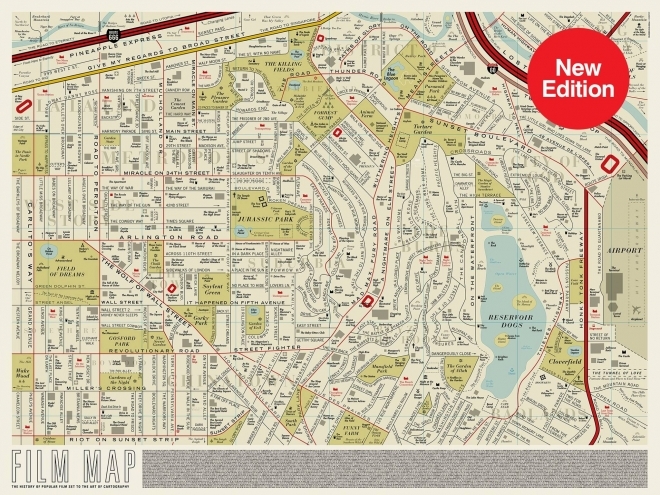 The Map, which is loosely based on the style of a vintage Los Angeles street map has its own Hollywood Boulevard and includes districts dedicated to Hitchcock and Cult British Horror movies. Like most cities it also has its own Red Light area. There's an A-Z key at the base of the Map listing all the films featured with their release dates and names of the directors.